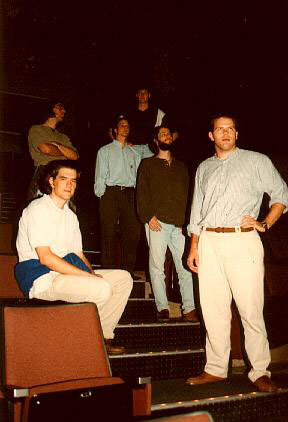 The Audio Research Team was an interdisciplinary research and production group based in the Georgia Tech Music Department. For two years I worked as assistant director of this group. As a part of this group, I led or contributed to projects focusing on data sonification, spatial audio, and large-scale multimedia. Our signature endeavor was StarChild, a multimedia opera which debuted during an arts festival prior to the 1996 Atlanta Olympic Games. The group also supported the music technology classes at Georgia Tech. Audio Research Team members (Left to Right) Alec Robinson, Jean-Paul Bulot, Jeff Clark, Ryan Feagin, Shawn Chaffin, and Jarrell Pair evaluate the custom eight channel surround audio system designed for StarChild: the Opera.